The castle’s history is closely associated with that of the Cooper family. 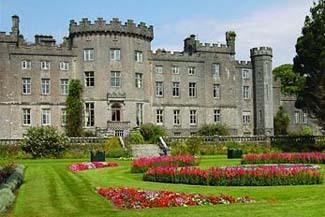 Coronet Cooper came to Ireland with Cromwell’s army in the 17th century and acquired Markree Castle as payment for services. (Cromwell chronically had trouble meeting his payroll.) After the siege of Limerick, Cooper married the widow of the chief of the defending garrison, Maire Rua (Red Mary), adopted her two sons, and together they had a third son. This son inherited Markree, and today’s proprietor, Charles Cooper, is his direct descendant. Although Markree has remained as the estate of the Cooper family since the time of Cromwell, nothing remains of the original castle. The present castle dates from the 18th century, with additions designed in 1802 by Francis Johnston, architect of many grand buildings in Dublin. After WWII, the main house was too big to maintain as a private residence and was closed off. It lay in sad ruins until recent years. Charles Cooper bought the property from his brother with the intention of transforming it into a hotel. If you’re expecting a posh, world-class hotel experience, Markree Castle is not for you. This castle hotel will appeal to those with a sense of humor and adventure. It’s a bit worn around the edges and filled with touches of faded glory, which can add to the atmosphere depending on your point of view. I like the scent from the wood-burning fireplaces that fill the air. I like the friendly, down-to-earth staff that aren’t scripted by management. Families with children and/or dogs will enjoy staying at Markree Castle. Both are welcome. Open: Spring through fall. Open in winter for weddings only. Collooney is about 10 km south of Sligo on N4. The road to the castle is on the south side of town and is signposted. The castle gate is about 1 km. farther. Nearby: trout and salmon fishing; golf; hiking; County Sligo Museum and Yeats Art Gallery in Sligo; drives through “Yeats Country”; hiking on Knocknarea. Exclusive use of castle possible; chapel for church blessings. Markree Castle is now open. Update coming! Lord Clark of the television series Civilization called Markree one of Ireland’s finest castles of its age. After driving through the arched stone gatehouse, and then on in via the narrow road leading past sheep and horses grazing on the castle’s 1000-acre estate, you confront an imposing five-story gray stone mansion. Despite its immense size, upon walking through the double wooden doors and up a stone stairway to the main hall, you feel like you’re in someone’s home. When the weather is chilly, fires blaze in cozy lounges that include a library—which once held 50,000 books—and a sitting area, featuring old paintings of the Cooper forebears. An unusual hanging oak staircase leads from the front hall past a stained-glass window depicting the Cooper family tree back to the era of King John of England. Guest rooms have views overlooking the garden or countryside and are decorated with rich mahogany furniture from the Victorian and Edwardian ages. Bathrooms are tiled and completely modernized. Tower room 15 is ideal for families: Rooms are stacked on top of each other, with a perfect room for kids on the bottom, topped by a room for the parents, topped by a bath accessible by a tower stairway. Ornate French plasterwork looks down on an elegant, highly regarded restaurant, which serves three-course table d’hôte meals. Children will love all the nooks and crannies to explore.